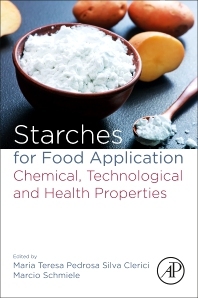 Starches for Food Application: Chemical, Technological and Health Properties examines the scientific, technological and nutritional knowledge of different types of starches, including their production and application in food, health and the environment. The book covers the links between biosynthesis, structure and the environmental impact on processing and nutrition. In addition, it covers starch identification and evaluation methods, along with production methodologies for food application, new sources of starch, modified starches for food application, and the relationship between starch, nutrition and health. Graduate at Biochemistry Pharmacy from Federal University of Ouro Preto (1988), master at Science and Technology of the Food from Federal University of Lavras (1991) and doctorate at Science and Technology of the Food from University of Campinas (1997). Nowadays is MS-3.1 professor at University of Campinas (Universidade Estadual de Campinas). Has experience in Food Science and Technology, focusing on Science and Technology of starches, cereal, roots and tubers, acting on the following subjects: baking, pasta, roots, tubers and thermoplastic extrusion. Márcio Schmiele has a Bachelor in Food Chemistry from the Federal University of Pelotas (2007), Master in Food Technology (2009) and PhD in Food Technology (2014) from the State University of Campinas. He worked as a professor at the Centro Universitário Amparense (UNIFIA), teaching courses in Nutrition, Industrial Chemistry, Nursing and Biomedicine between 2015 and 2016. He worked as a Chemist at the State University of Campinas between 2012 and 2016. Currently Professor of Higher Magisterium Class A - Attachment A, Level 1 of the Federal University of the Jequitinhonha and Mucuri Valleys, Campus JK, Diamantina. He is also a permanent lecturer and adviser of the Graduate Program in Food Science and Technology of the Federal University of the Jequitinhonha and Mucuri Valleys.